Two platforms stand firm in an earthquake zone off the Philippines, producing natural gas used to meet around 20% of the country’s electricity needs. Discover how the Malampaya energy project has equipped local people with skills for a better life, including Brenda, the first female welder in her region. And see how the nation’s oldest tribe is welcoming electric light into their homes for the first time. About 90% of the world’s earthquakes occur in a huge Pacific Ocean basin called the Ring of Fire. 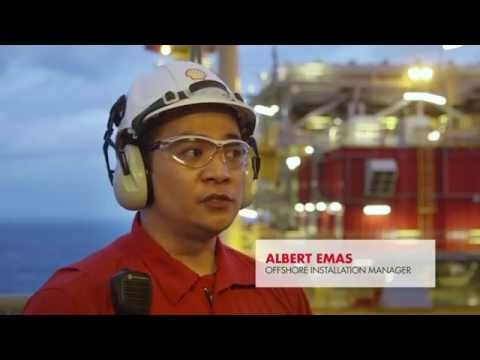 How do you safely unlock natural gas from a platform at the ocean surface where tremors and typhoons strike? Malampaya Deep Water Gas-to-Power Project. Footage of a Philippine city, some fast motion shots, showing roads and highways filled with vehicles and pedestrians, cutting to a low-angle shot of a flag flying against the sky, and then to footage of trees bowing in typhoon winds and then to a smoking volcano. The Philippines sits in the ring of fire, a basin in the Pacific Ocean where the world’s largest earthquakes and volcanic eruptions occur. Footage of the scenic beauty of Palawan, including footage of elements of the Malampaya deep water gas-to-power project. Yet here, 80km West of Palawan, clever engineering has safely unlocked natural gas from deep below the West Philippine Sea. This is the Malampaya Deep Water Gas-to-Power Project. Managing Director for Shell Philippines Exploration B. V.
We can withstand a typhoon like Haiyan. That requires a high degree of, engineering expertise to be able to make it happen. Close-up of Sebastian standing in an office environment. Footage of men dressed in safety gear, working at laptops. A screen displays drawings of the platform design. Underwater footage of the platform cutting to panning wide shot of the platforms in the ocean. Still shot of the Malampaya platform. Text displays frame-left. Built in 2001, Malampaya provides enough energy to meet around 20% of Philippines’ electricity demand. It’s the largest and most significant industrial investment in the history of the Philippines. We’re the only ones here in the Philippines so if we do not supply natural gas, there’s no one to take over. Footage of workmen in safety gear standing on one platform and looking towards frame-right. The shot pans to the second platform at frame-right. Close-up of Albert standing on the platform. It has generated billions of dollars in revenue for the national government and reduced energy imports. And it delivers a more stable supply of cleaner energy in the form of natural gas. The gas is piped from the platform onshore and used as fuel in power stations, producing electricity. Cut to beauty shots of Malampaya, then to footage of the busy streets of the city. Wide shot of workmen in safety gear working on the platform, cutting to underwater footage of the platform and back to footage of the city skyline and streets. We employ deep water technology. Basically it’s harnessing natural gas in deeper waters. There’s more complex drilling, subsea facilities, and subsea technology that’s being employed. Close-up of Albert standing on the platform cutting to CGI imagery of the platform and pipeline beneath the surface. A white line and text indicates the depth at 820 metres. CGI imagery shows further detail in the subsea facilities. In order to extract gas in such challenging conditions, Shell first built a shallow water platform 14 years ago. 50 kilometres out at sea with strong currents and typhoon winds, one issue was stability. And one way to overcome this, was weight. It sits on the sea floor, weighing around 13,000 tonnes, or more than 7,000 average-sized cars. Footage of the platforms and the ocean, including underwater shots of the platform. The weight is a factor of being able to accommodate all this equipment into such a compressed area as well as also to keep the facilities stable, sitting on top of the seabed. Close-up of Albert standing on the platform cutting to CGI imagery of the subsea facilities. The Malampaya shallow-water platform has produced gas for the last 14 years, but as the pressure of the reservoir fell over time the gas produced wasn’t high pressure enough for the onshore network. A second platform was built alongside the first to compress the gas. Footage of the platforms and the ocean, including underwater shots of the platform as well as close-ups of various above water parts of the platform. This time it was really different type of technology. Quite novel. It actually is a barge with legs. So picture a barge that’s floating in water, when it reach this particular area, the legs then drop down, and then the barge went up and it became a platform. This is the first self-installing type of platform that use this technology. So we are again ground-breaking here. Fast motion shots of the construction and floating out of the platform, interspersed with CGI imagery of the platform being floated out to sea. Close-up of Sebastian as previously described, cutting to more footage of the platform being floated out. CGI imagery shows how the legs drop down to the seabed and the floating structure rises to form the platform. Fast motion shots of the platform in the ocean as it is self-installed. So at the back here you can see the Malampaya Shallow Water platform. Now where we are is the Depletion Compression platform. Close-up of Albert standing on the platform and gesturing to the Malampaya shallow water platform and cutting to footage of the depletion compression platform. In extreme weather, these platforms move more than a metre in all directions, so all the pipework running across the bridge has to be flexible and keep working, even when the structures are moving. Footage of trees blowing in strong wind and dark clouds racing above the ocean, cutting to high angle view of the legs and pipes of the platform where they meet the water. Footage of the pipework running across the bridge, cutting to a low angle shot of two workmen in safety gear crossing the bridge, and then to underwater footage of the platform. Bird’s eye view of a platform support vessel rising and dipping in the waves. Close-up of Sebastian as previously described, cutting to footage of rocks being tipped into the water and underwater footage of the platform resting on the even surface. Close-up of Sebastian as previously described, cutting to fast motion footage of the depletion compression platform. The piping and structural designs are built to survive 100-year storms, and 1000-year earthquakes. And these get tested every year. With new technology, Malampaya extends the power supply for the country, keeping the lights on in the Philippines for years to come and playing its role in the global energy system. Close-up of the piping panning up to footage of the platform. Footage of Sebastian and colleagues at a workstation, pointing at data on a computer screen. Footage of the platforms in the ocean, showing the lights coming on on the platform as night falls. Footage of the city streets by night, lit up with the lights of the vehicles on the road. Wide view of the city skyline by night. Shell Pectin centred on a white background. Meet Brenda, the woman who broke the mould in her Filipino village when she trained as a welder. Discover how a skills programme is helping young adults leave unemployment and poverty behind. The Batak are one of the Philippines’ oldest indigenous peoples, living deep in the forest of Palawan. A new programme is bringing electric light to their community for the first time, promising a better quality of life.